We wanted to make a pedal that could faithfully reproduce the tones of a specific citrus colored, British amp made famous by artists like Jimmy Page, Weezer, Queens of the Stone Age, and Slipknot… A distinctive tone that stands out in terms of power, width and dirt. After spending countless hours tweaking the circuit and testing it against many tones from those great amps, we were able to produce the one pedal that captures that attitude – the cataPulp. The cataPulp’s gain structure truly represents what every great amp in a box (AIAB) should be – with super clean tones that get increasingly dirtier after the “12 o’clock” setting; it allows you to cover a lot of ground between those classic rock inspired tones all the way to a thick syrupy metal territory – You can use this pedal as a tone shaper or a secondary gain stage – as always with a Wampler, it’s a truly versatile tonal workhorse! 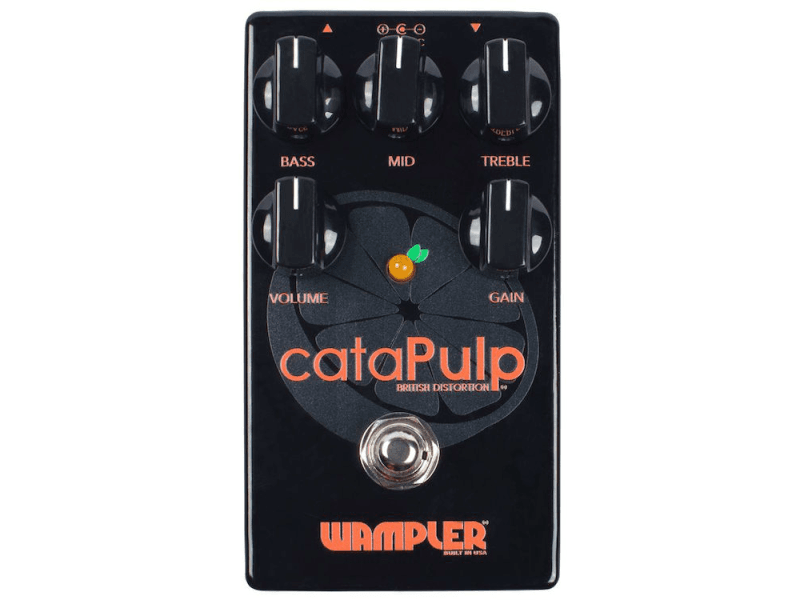 The cataPulp also features an active 3 band EQ that will allow you to tweak and control your tone perfectly. There are some overdrives that truly deserve to be called “legendary”. One of them, without doubt, is the green stomp that drove many guitar tones straight into that sweet spot. Blues and non-blues guitar players have used Tube Screamer® type circuits for years to help them create their personal signature sound. Over the years, countless players have been asking Brian to create that world famous vintage mid-range overdrive – well he finally did it! The Clarksdale is our take on that world famous lime green overdrive many of us have come to love– with a few great Wampler styled improvements of course. The world of boutique pedals is filled with lots of great clones of that already famous circuit– so what else could be done? We wanted to create a pedal that would be true to the sound and feel of the original but would have a wider range of tonal options – to satisfy even the biggest tone chasers out there. The addition of a 3 band EQ (Bass, Mids are active, and the Treble is similar to the classic TS tone pot) it allows a player to have a more tailored tonal pallet than the original. The Lift/ Smooth switch will also allow a player to either sit in the mix with the Smooth setting or allow your leads to standout with the Lift option. 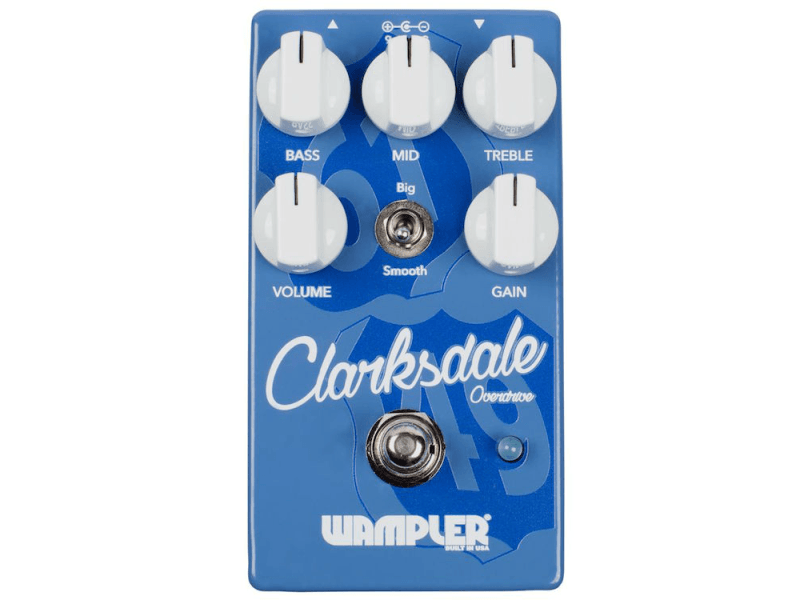 Also unlike the original “green giant” the Clarksdale will not “fizz out” as much at low or high gain settings. Even since the release of the Triple Wreck in 2008, Brian has been wanting to make a more modern version of the gain, a more contemporary tone designed for modern high gain players. The trouble is, it kept changing - moving - developing. Recently, a style of tones has come forward that has been devastating in not only the power of the gain, but the depth and clarity it provides to the player. 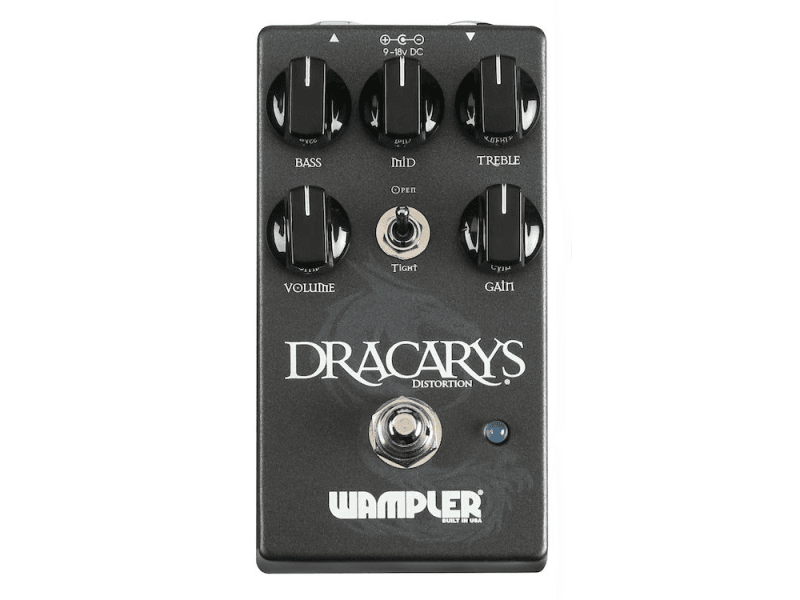 Long gone are the doom laden distortions that destroyed the guitars tone and dominated mid ranges, now it's all about the clarity, articulation, face melting, fire breathing distortion that will bring a wall of sound from your amp. With the now famous Wampler 3 band active EQ to sculpt the tone perfectly, also included is a gain switch giving you two different styles of distortion. Open - is, as you might guess, extremely open and free - minimal compression with maximum tone. Tight brings in a natural compression, like a tube amp being driven to the very edge... the great thing about the tight is that when on a lower gain setting it can do a really good lower gain tone as well, this setting makes the Dracarys one of the most versatile modern distortions available today. There is no waste with this pedal, all tones are useable and easily available. When we designed this pedal, the focus was ensuring the playing dynamics could be retained and that the compressor didn’t color the tone at all. By incorporating a clean blend, it allows your original signal to be blended back in so you can get all the benefits of a great compressor (picking up the notes that aren’t as strong and increasing sustain) but have the option to remove the squash at the front. With this control, you can have full country squash or open studio level parallel compression. How many times have you sat in front of your favorite ambient pedal and felt like you need weeks of training at NASA to use it? Knobs, switches, sliders…It’s often SO hard and frustrating to find a usable tone on those things quickly... Keeping that firmly in mind, when we first considered making an ambient pedal, ease of use was a top priority, right up there with top tier quality tone on par with pedals at twice the price. 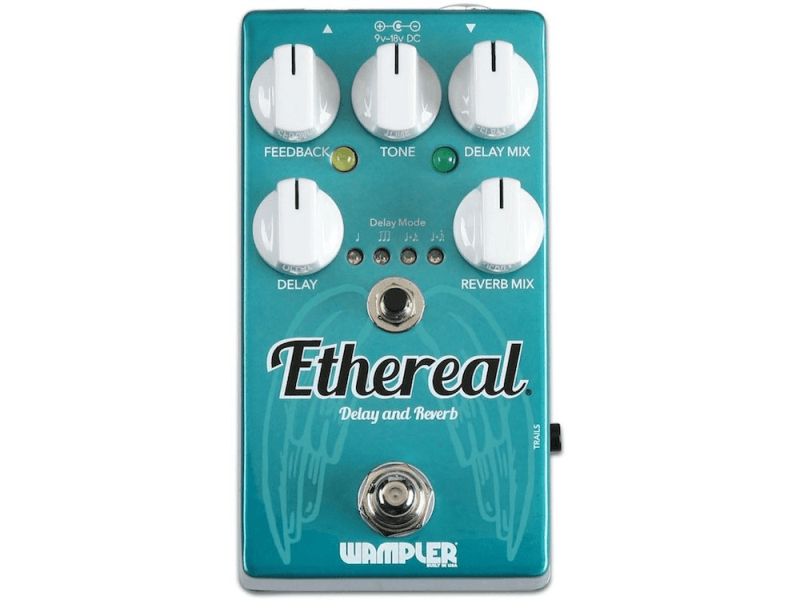 How do you describe a pedal like the Wampler Ethereal? Does ambient heaven cover it? Is it the gateway between real life and the astral plane? Or is it just gorgeous? It’s hard to know which phrase to use when talking about it, because they all match it perfectly… plus, of course, so easy to use you’ll be getting those perfectly Ethereal tones instantly. When designing the Ethereal these were the EXACT thoughts running through the mind of Brian Wampler. He wanted to make a delay that is as pure as you could want, with a time of up to 1s, a reverb that is thick and then have the option to mix them all up and put them together in one glorious effect that will send you away… all the way away while making it as easy to use and easy to find those perfect tones as possible. Oh, and did we tell you – it’s been a bit of a secret, there isn’t one delay lurking within the Ethereal, there are two! The first delay constantly sits there like a heartbeat, coming back at you at quarter notes, we then layer another over the top – that one can be put into a triplet pattern, or a dotted 8th (so you can get that beautiful quarter + dotted 8th mix) and even a self-oscillating dotted eighth pattern that just takes you away and leads you over the edge and down the rabbit hole into perfect ambience… Things can get a little crazy when that one is selected, so you know, knock yourself out – it’s there to make some incredibly strange yet beautiful sounds… See that little switch down there? Yep, that’s the one, just to the right of the stomp - that’s a trails button. When this is used the delay patterns and reverbs sing out after the pedal has been deactivated, so you can even control what you want to come back at you. While you are enjoying the delay patterns, sitting underneath is that beautifully cavernous plate style reverb that is alive with character and shape, that can be brought in to exactly the right level (whether that be under your guitar, the same level - unity, or even considerably louder) to compliment the delay. 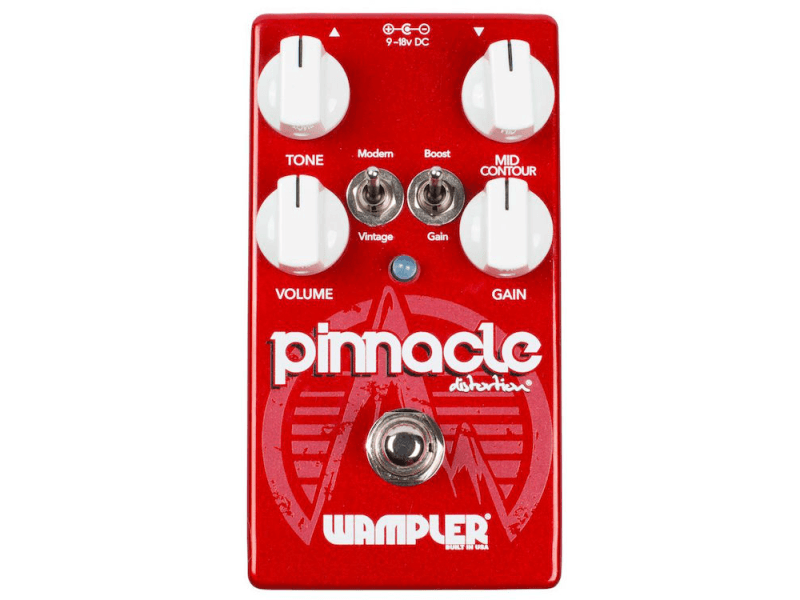 As you can imagine, this has been some feat of engineering (definitely worth waiting for) as we wanted all this to happen from a regular sized box, with the purity of tone and response you would expect from a Wampler. So, as with our other time pedals, we split the signal going in, the effected signal is then laid back on top of the original base tone, making sure that YOUR guitar sounds exactly how it does going in. 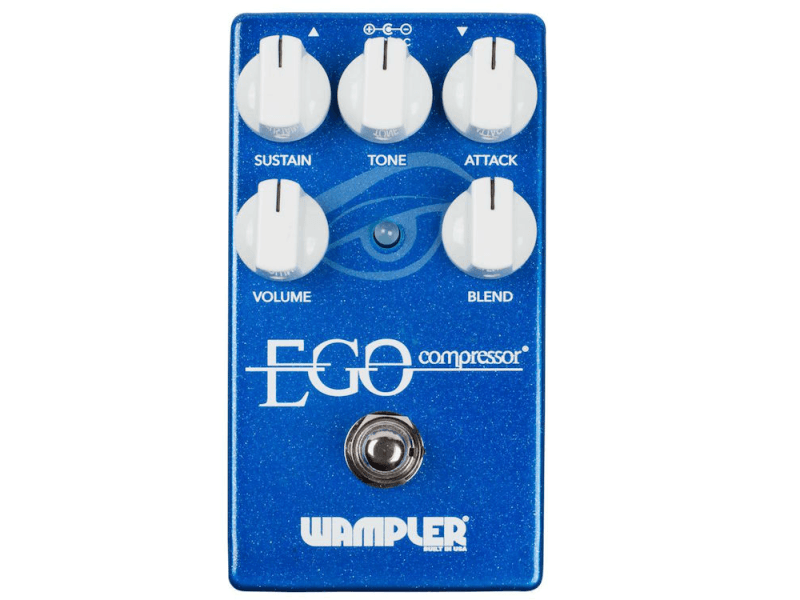 The Wampler Ethereal. Not only can it be used a stand alone reverb or delay pedal, it can be combined for you to worship, to get lost in, to even help you inspect your shoes… but most of all, it was designed to inspire. Whether you choose a long drawn out delay time, a short slap back, or just enough delay and echo to fatten up your rhythm section – a great delay pedal can take your guitar playing to the next level. 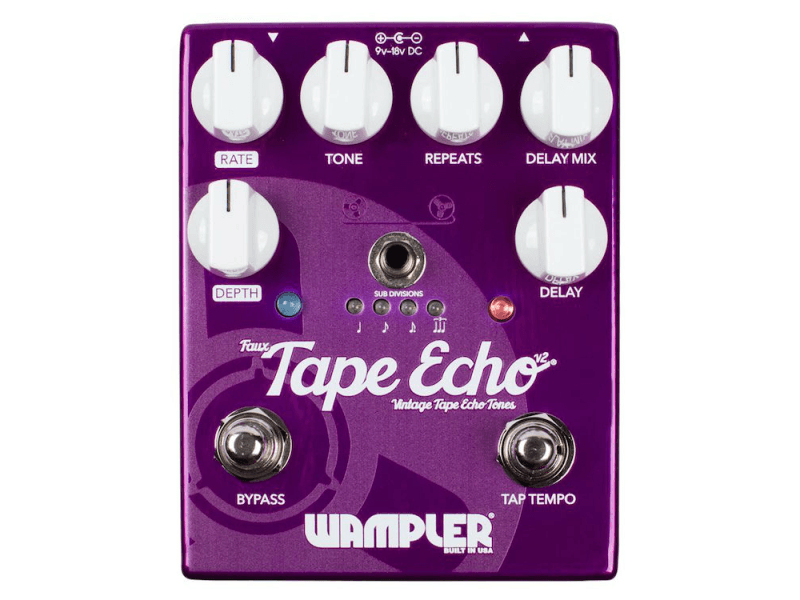 The Wampler Faux Analog Echo is a pure sounding, straight ahead delay pedal that will allow your tone to remain intact note after note – without coloration. For this reason, the Faux Analog Echo has found its way on to the boards of countless musicians. 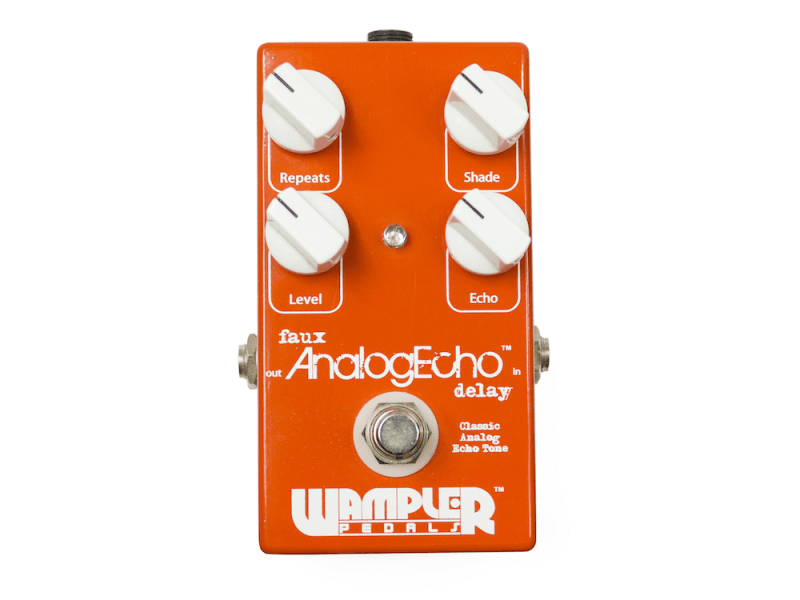 From the weekend warrior to country playing greats like Brad Paisley and Brent Mason – the Faux Analog Echo will be your go to delay pedal night after night. The Faux Analog Echo is based around the industry leading pt2399 chip. The industry standard for delay pedals. We treat the signal path in such a way that the dry path and the core signal are completely unaltered, we only use the chip to make a digital replication. Simply put, your tone remains pure and intact, without thin and brittle sounding repeats. With the addition of a tone knob, you can incorporate a little sparkle for digital crispness, or take it all the way out for a more natural and organic tone. Whether you are playing sold out arenas or not, The Faux Analog Delay will allow your tone to remain the way it should – pure and intact – note after note. Battery connection and 9v power jack (barrel plug like Boss) Please note: Battery not provided. Mains power receommended. Battery connection and 9v power jack (barrel plug like Boss) Please note: Battery not provided. Mains power recommended. Sub divisions available on Tap Tempo. Quarter, eigth, dotted eight and Triplets. The Brent Mason Hot Wired v2. The only pedal versatile enough to be taken into the world's most demanding studio environment every day… Nashville master sessions. A lot of people think they’ve never heard of Brent Mason. We would bet that although they may not recognize the name, chances are huge that they have heard him. Brent is, without doubt, the number 1 session guitarist working out of Nashville and has been since the early 1990’s. Not only is he a legendary studio figure, but also a renowned composer and songwriter. His compositions have been used in countless films, TV shows and commercials. 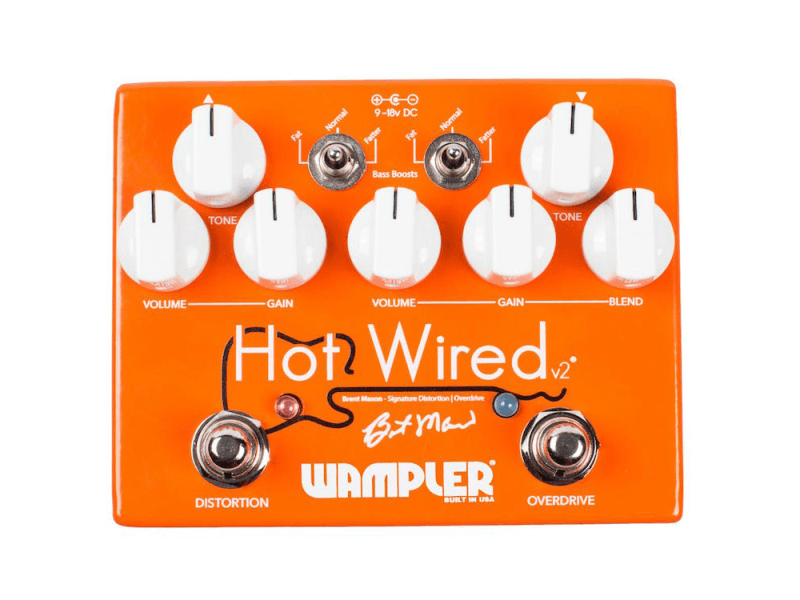 His solo albums, in particular “Hot Wired” (from which this pedal got its name) has become almost mythical in its reputation for guitar tone and quality of musicianship. With Brent, you will not believe it until you hear it. Built on the foundations of the extremely popular v1, v2 stands alone in terms of versatility. The studio scene in Nashville has changed over the last few years, so we changed the Hot Wired to mirror the industry Brent works in. v1 was geared towards all out chickin’ pickin’ and beyond. Expanding on that, the v2 brings you a broader range of subtlety in channel 1. You can still find the chickin’ pickin’ tones, but you can also find a deeper, warmer overdrive section that will allow you to play as smooth as you like. With the added blend control, you won’t believe how fat your tone can be without it sounding too overdriven. Channel 2 still has the same “British Plexi” flavor that Brent loves. Two pedals in one (overdrive and distortion), the Hot Wired is without doubt one of the most versatile pedals available today. One channel of the Hot Wired has all your overdrive needs, from a gentle break up to all out crunch, the other gives you dirt… Loads of fat, creamy distortion that is tonally perfect from top to bottom. If need be you can stack them both together for a huge, huge sound. The trouble with distortion pedals is that many of them only serve one function. We all know that the distinguished tone chaser sometimes needs extreme gain, sometimes needs mild overdrive… sometimes needs something that does both of the above and everything in between. The Pinnacle not only does that, but it also brings the most convincing “Brown Sound” to be ever heard in a pedal! With two separate styles of gain structure, a powerful mid contour (from scooped to mid hump) control and a control that squeezes out every ounce of tone from your guitar, you’ll notice that the Pinnacle is called that for a very good reason.